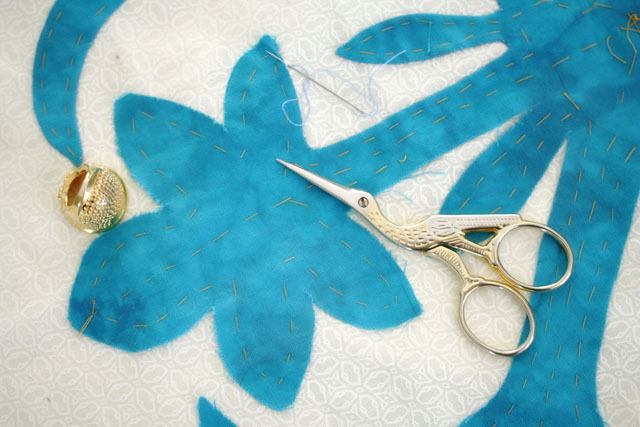 I like to have a few “totable” works in progress at all times–and Hawaiian applique is a perfect, totable project. 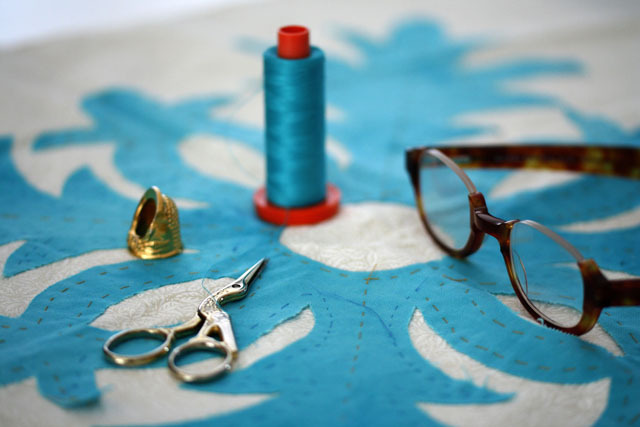 It has no small pieces, requires only one spool of thread and doesn’t require a great deal of concentration to stitch. 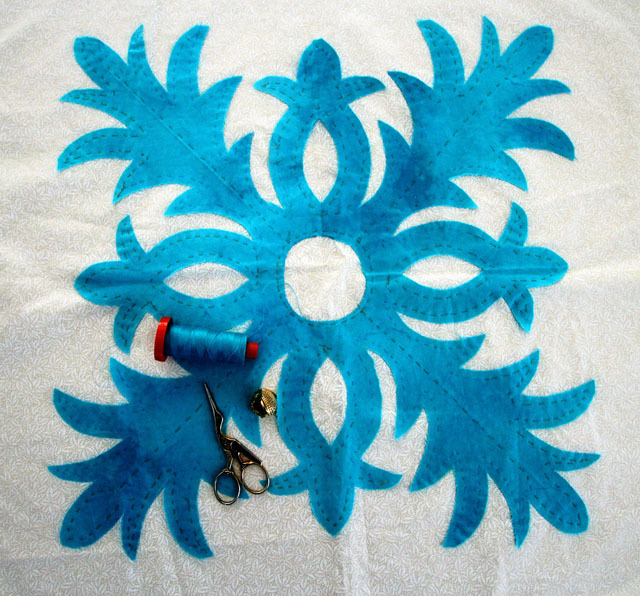 This applique pattern is from Pokolani Quilts. 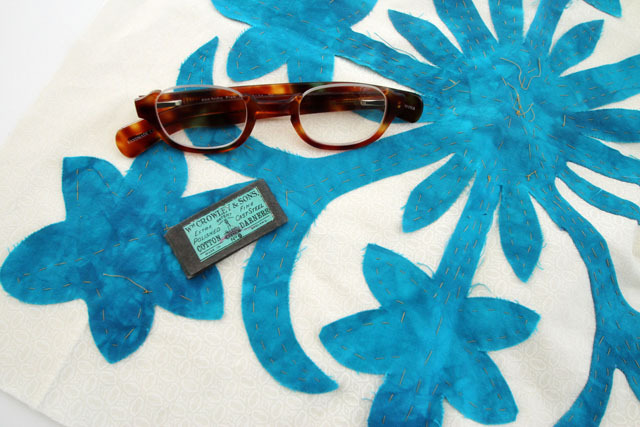 and is cut from a hand dyed fabric…perfect for Hawaiian appliqué. It takes a while to baste, but it is worth the time because it makes the project portable--no pins! What’s your favorite totable project–(besides doodling)? I am working on a complicated Baltimore Album Quilt, but it does require adding pieces–and concentration, so not so totable! Don’t know much about Hawaiian applique, except that it looks pretty and also looks like it would be fiddly. Is there a next step after the top photo? I can’t see clearly if there’s still some work to do with the raw edges. Would love to learn more. Sure, I’m always interested. My project list grows longer every day. I just bought a really lovely book about felting. I bet you know what that’s like. There are so many interesting things to do…. So much to do…sew little time, but I would love to learn more about felting! 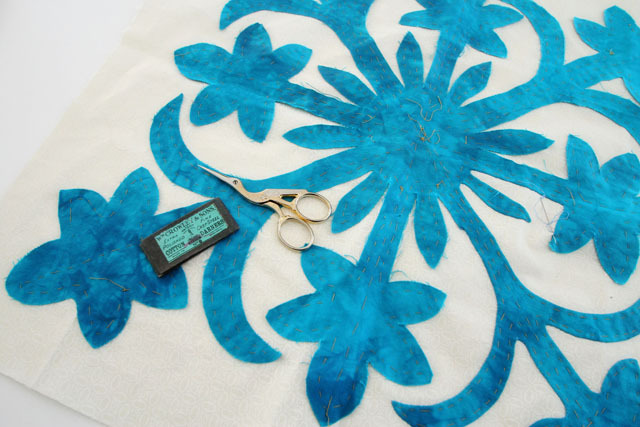 I’ve been toting a hawaiian applique project to my quilt bee for several years. I guess I’d make more progress if I worked on it more than a couple hours a month 🙂 Your project is lovely – that is a really pretty blue hand dye. Thanks so much. I had a project that I toted around for years, never really expecting to finish. Then it got to the point that almost 3/4 of the blocks were done–that’s when I really worked on it in earnest to get it completed. Unfortunately, it is not quilted…I want to hand quilt it, though that could mean it never gets done….